Nueva Televisora del Sur (TeleSUR) is a satellite and terrestrial channel aimed to Latin America with its headquarters located in Caracas, Venezuela. TeleSUR was launched in 2005 with the objetive of promoting information related to Latin American integration. Its contents are broadcasted in English, Spanish and Portuguese (for Brazil), and reach a global area in its diffusion, including Latin America and the Caribbean, Europe and Northern Africa.TeleSUR needed a system to control the complete work ow of its recently launched English news platform. 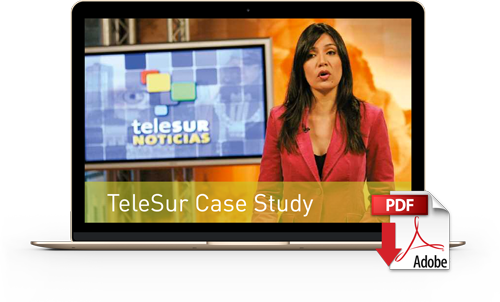 In this particular case, TeleSUR needed a system to control the complete workflow of its recently launched news platform in English. Ambitious project comprising 22Ch for ingesting, 15 MAM licences, 15 VSNIPTRANSFER licences and 48TB of storage integrated with the editors Avid News Cutter and the iNews system. A major challenge solved thanks to a contribution server for IP accelerated content, VSNIPTRANSFER, in order to send notes in native format directly to the production center from anywhere in the world.